I have a love for funky, fun and unique garden plants. Here’s one to try. It’s called Sea Holly, and it’s actually in the thistle family. 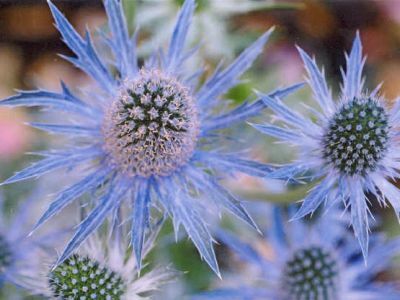 Sea Holly is a perennial garden plant, which means you plant it once and it comes up year after year, somewhat depending on your climate. This plant never did fail to bring attention and comments from people seeing my garden. It grows about 3-4 feet high, very branchy and the branches are a brilliant electric blue color. It’s stunning! The only drawback to this lovely plant, in the fall you must cut it to the ground and burn or compost the plant. Do not let it go longer than that, casting it seeds or you’ll soon discover it’s family trait of being in the thistle family, if you know what I mean. The following spring, it’ll come back again to it’s beauty. It is an easy plant to grow and does best with full sun, or as much sun as is available to you. I live in the Pacific Northwest, U.S.A. so we get a lot of rain and fairly mild summers and yet it seems to be enough for this plant. You can search for Sea Holly seeds in seed catalogs or sometimes you can find it in some nurserys. An internet search would surely find you a source for this lovely plant. I thought I’d let you know about one of the coolest, funky plants for outdoors I’ve ever run across. It’s called Evening Scented Stock, it is NOT the common stock, however. This is an annual plant, that needs to be sown early spring, directly into the soil where it is to bloom and grow. I recommend planting it nearby windows and doors, porches, etc. This plant really doesn’t look like much in and of itself, it’s not a pretty plant per se..but when about 5:00 PM rolls around watch it do its stuff! This plant has a VERY powerful fragrance similar to hyacynths or lilacs. At the gentlest breeze it sends a waft of fragrance to die for. This is why it’s so excellent to plant near a window, door or pathway. When you open up your screen in the evening, this will scent your entire house. One place that I have found the seeds for this rare plant is at Fragrant Path, PO Box 328, Fort Calhoun, NE 68023 They were about $1. a packet but the price may have gone up. Please write and ask them. Enjoy! Here’s another one to try. This one is called Autumn Crocus. In this case you can tell a lot by it’s name. You generally purchase it as a bulb, which are usually quite large. It does return year after year without needing to re-plant it. In the spring it shoots up a lot of foliage, this is preparing the plant for it’s autumn blooms, be sure to just leave this alone. Come about June or so, this foliage starts looking like it’s dying, again just leave it be. In late August/early September, when most of the flowers are past their prime and the garden is starting to look sparse, out comes the Autumn Crocus, with their beautiful lilac colored blooms. They bloom for quite a long time when few things are blooming. A fun plant, give it a try! This one is an annual (only lives 1 growing season) plant called Love Lies Bleeding. It’s as strange as it’s name. It is very easy to grow. You just simply direct seed it in the soil (full sun preferably) where it is to grow in the spring. It’s height seems to vary greatly. I’ve seen it be as small as about 2 feet high, and reach up to 6 or 7 feet high. It’s “flowers” are long, burgandy colored ropes that hang. It is simply stunning. Always gets attention! It will usually re-seed itself so you’ll get new plants the following year without doing anything. It’s best to try to find this seed in an unusual type seed catalog. It is in the amaranth family. Here’s the last one. Ever tried the hellebore family? There are many varieties. They are perennial which means they come back year after year. These are best planted in shady areas, but where they will get sun in the winter, like under leafed trees or something of that nature. What is so unusual about hellebores is that they bloom somewhere between Dec. and March. There are very few plants that do that! One variety is called a Christmas Rose. It’s quite striking to see flowers in the midst sometimes of snow. These plants usually must be puchased at a nursery. Check out your local nursery for this wonderful family of plants.